According to our local guide, Alexander Pushkin is to the Russian people what William Shakespeare is to us Brits. 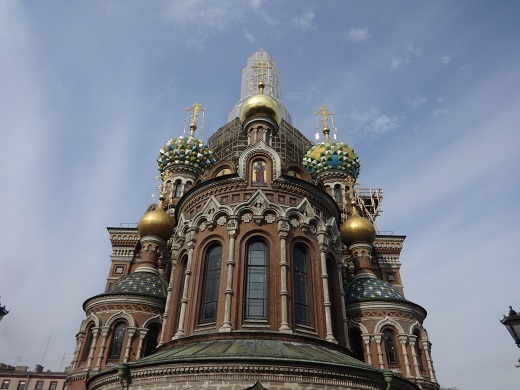 Although born in Moscow, he has strong associations with St Petersburg, which happened to be one of the ports of call on our cruise around the Baltic Sea. We enjoy cruising and usually choose the Mediterranean for the sunshine. Occasionally, though, we opt to go north and have cruised to the Norwegian fjords and the Arctic Circle. This Baltic trip attracted us for the variety of ports in six countries we’d never before visited. 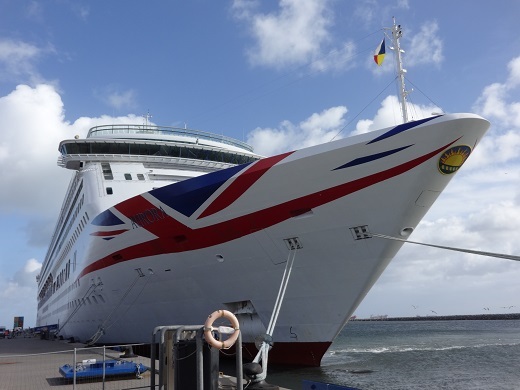 This isn’t going to be a lengthy post; it’s more an excuse to say a little bit about the cruise and show a few photos. 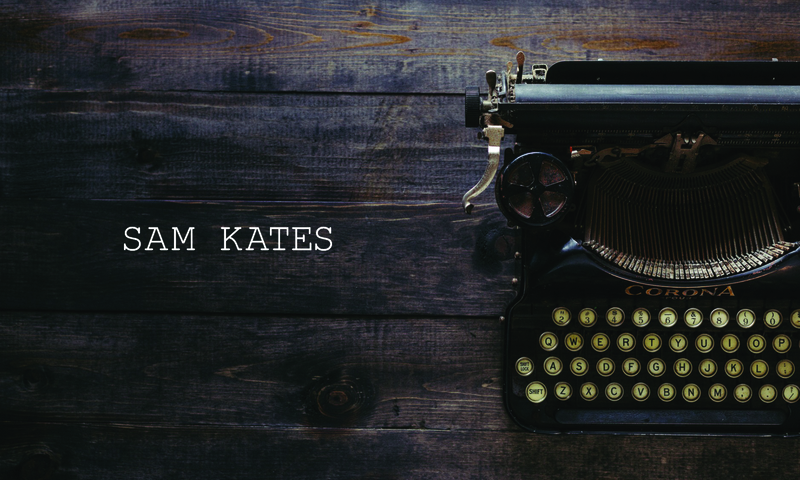 But, to obey my self-imposed rules about what I post on this site, I have to include a link, no matter how tenuous, to reading or writing. Thus, Pushkin. I regret to admit that I haven’t read anything by him and, honestly, will probably never do, though at least he is now on my reading radar. Anyway, the ports. My favourite? 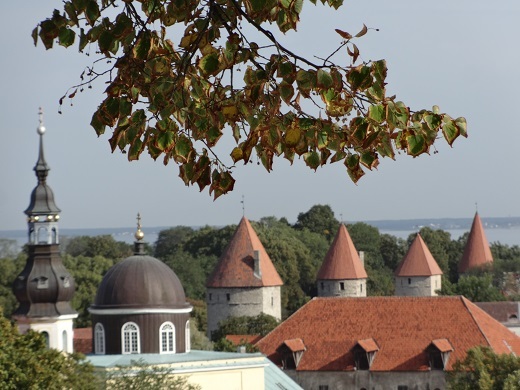 Based on what we did there and the sheer beauty of the place, it has to be Tallinn in Estonia. 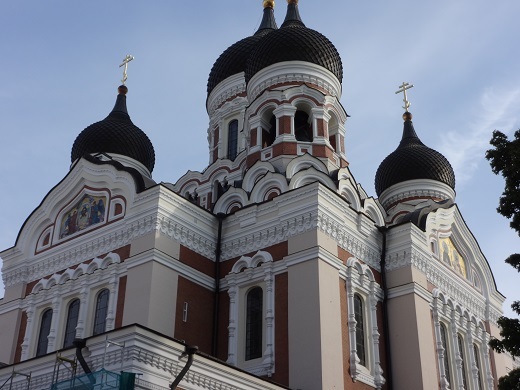 Here’s a view of the city—the black-domed church above is also in Tallinn. Copenhagen is probably a close second. 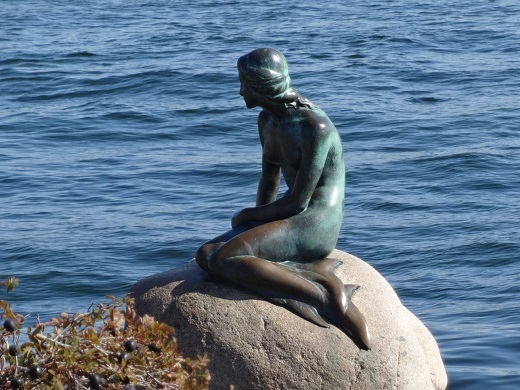 Once home, of course, to Hans Christian Andersen (another writing link; go, me), whose association is commemorated, amongst other things, by the statue of the Little Mermaid. Riga (Latvia) is also beautiful; Skagen (Denmark) is chocolate-box quaint; Helsinki (Finland) gave the impression of being unfinished, there was so much construction work going on, though is still lovely; Kiel (Germany) is interesting, though a little strange (they have a park called Hiroshima Park, which contains a statue of Bismark). 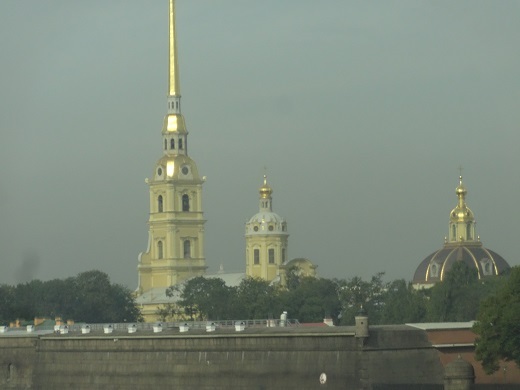 The port that made the deepest impression, for not necessarily all the right reasons, was St Petersburg, the city of many names. 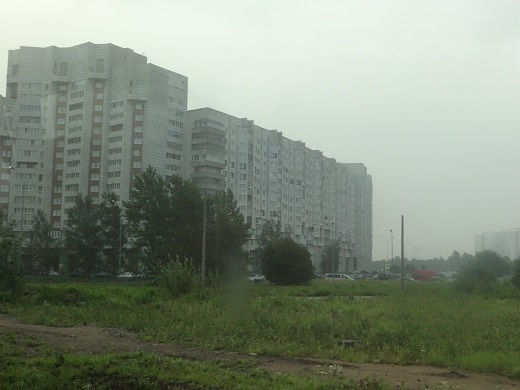 Our first sight of Russia was underwhelming, sinister almost: row upon row of ugly concrete apartment blocks poking from the mist. We passed many more on our coach ride into the city centre, a lot of them in a state of disrepair. It was grim, a dystopia, Orwell’s vision of the future brought to life. Then the sun burned away the fog and revealed a city of stunning contrasts. Fairytale churches and cathedrals; glistening gold-domed towers and spires; forbidding, official-looking buildings; imposing monuments. The square behind the Winter Palace, said our guide, is larger than Red Square in Moscow. 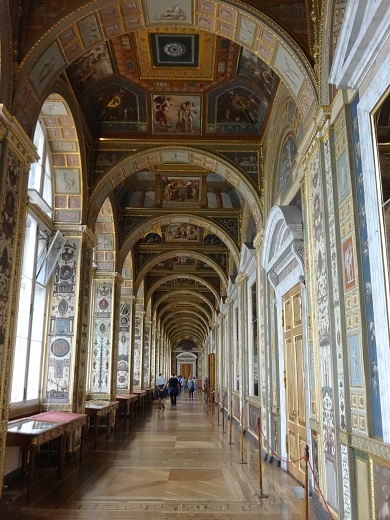 If you ever visit St Petersburg, take a tour around the Hermitage Museum. 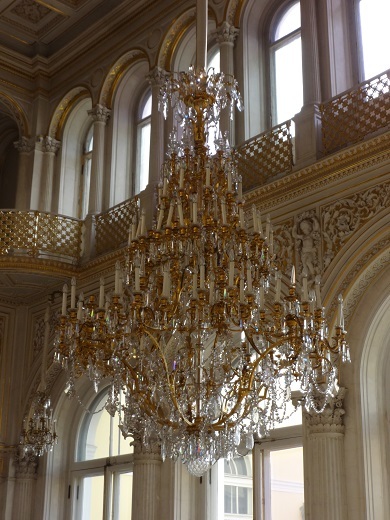 Formerly a palace complex of the Tsars, it has been preserved in much the same state as it was in 1917 when the city was known as Petrograd, the Romanovs held power (until the abdication of Nicholas II in February) and the October Revolution was signalled by a blank shot from the battle cruiser Aurora (coincidentally, the same name as the ship in which we had cruised into St Petersburg). Here are snaps of them both. 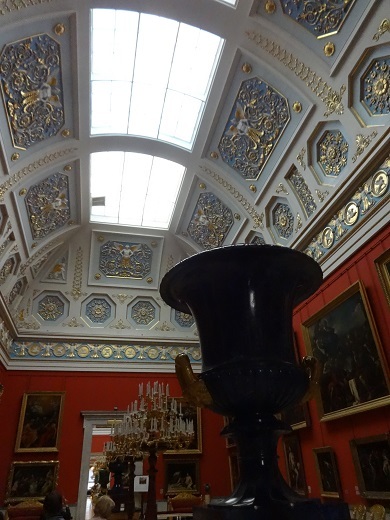 Apparently, if you were to spend 30 seconds viewing every single exhibit the museum holds, it would take you around eleven years to see them all. We spent a few hours there and barely scratched the surface. It was a jaw-dropping tour, marvelling at the lavish opulence—I’ve never seen so many grand chandeliers and ornately decorated ceilings, so many paintings outside of a specialist gallery by masters like Da Vinci and Rembrandt, more gold (I imagine) than even the Vatican—while privately thinking it was little wonder there was so much discontent among the masses to have such riches in the midst of what must have been at that time severe deprivation. 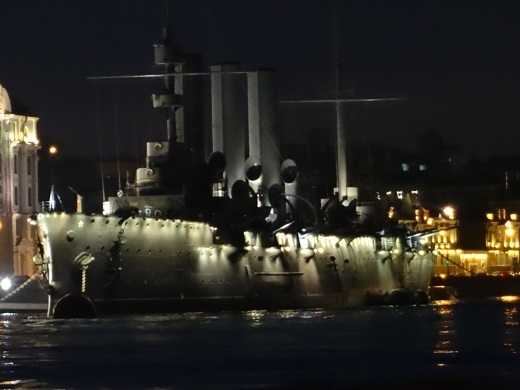 St Petersburg (then known as Leningrad) is also famous for the failed siege by Germany in World War II. 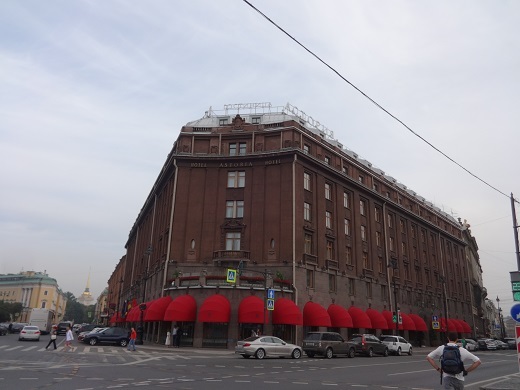 This is the hotel where Hitler planned to host a dinner to celebrate his conquest. He apparently even went as far as having invitations printed with only the date left blank. We only spent hours at a stretch in these ports, enough to gain a flavour. But, without exception, the places we visited were captivating. If you’re ever wondering whether a trip to the Baltics is worthwhile, I’d say, resoundingly, yes. 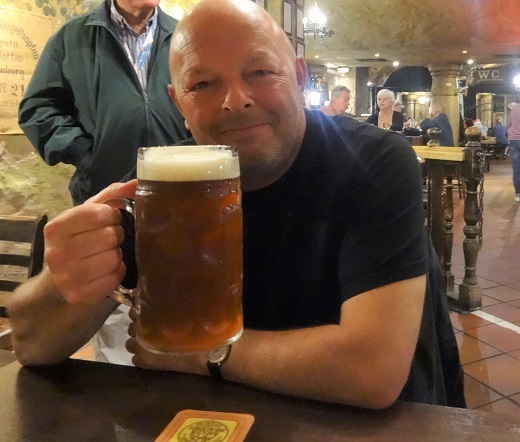 To finish, a snap of me supping a stein of locally brewed beer in Kiel. These things have to be done. Cheers!